to prepare to repaint some of my dolls. I hope you make the best of it, too! about the things he love. how excited I am to have him over. Go go go, Philippine creative doll collectors! Shasha: Hi Jake! First of all, please know that I am such a fan of your Instagram account, The Barbie Look book! I love your clean, sophisticated photos and your dolls are always stylish! So thank you so much for giving us this opportunity to get to know you, the creative brains behind this beautifully curated feed as well as hopefully to get some tips from your experience. Jake: Thank you Shasha! It’s my honor to be featured on your blog - I always drop by once in a while. Not to mention, the doll clothes you make are amazing specially the craftsmanship and details! You put into them a true work of art. Shasha: Thank you so much for the kind words, Jake. Now apart from seeing the awesome work in your Instagram feed, we would like to know the person that makes all this possible. Please tell us a bit about yourself, your hobbies, favorite things, and stuff we don’t usually see in your fabulous account. Jake: Hmm… Well, I live and work in Dubai for almost 7 years now. I like traveling and I can’t stay in one place really as I like exploring cities and countries. I’m also into Japanese culture, anything Japanese basically, and my trip there last year was one of my dreams. Of course I got a lot of doll stuff there, too. On the side, I do a bit of commercial and print ad modeling – It’s basically where I get my extra money to fund my doll hauls and travelling. Shasha: Wow, you’re a commercial and print ad model, too! No wonder you have that great sense of style! Can we say that this prompted you to create this doll account? Jake: I used to be a stylist for print and TV back in the Philippines and I really miss that job. When I moved to Dubai, I didn't really have an outlet for my fashion ideas so I was looking for ways to do that, and I figure out styling dolls would be the best way since I’m not into buying clothes for myself. Also living alone abroad can be really stressful and lonely so my dolls and this account are my stress-busters. When I play with dolls, I zone out and concentrate on that small fashion world I’m trying to create. It’s really therapeutic for me and a creative outlet as well. Shasha: The Barbie Lookbook has gained a huge following all over the world. What do you think are your top 3 talents, which are probably your main tools of the trade in running such an interesting account? Jake: I think the most important of all is you have to love what you do, and the likes and followers are just added bonuses. When you like what you’re doing it shows and reflects through your work. Another thing is your creativity, and how you make use of what you have. You don’t need the newest or the most expensive doll or a lot of clothes. It’s how you put things together and present it to your followers. Interaction and sharing of ideas is also important with me. I like to talk to my followers and share them tips I know and vice versa. They really inspire me to continue what I do and I hope I do the same with them. I really consider them as my friends all over the world. Shasha: What are your top 5 places/things/sites/people to get inspiration from? Jake: I get inspired by other accounts as well and just try to put my own touch or spin in whatever I see online. Malls and shop windows are also where I get my inspiration, I would see a person walking and I will be like “Oh, that’s cute I think I can do that look.” I also frequent forever21's window display they always seem to be on trend and reflect what is happening in fashion. Before, the internet magazines are my major source of inspiration. I would go to book sales (second hand magazine shop) and would look for back issues of Nylon Magazine, Teen Vogue among others and would just try to absorb and make mental notes of the looks they have. The 90s era is also a big influence to me since that was my time LOL! It’s where I get my fashion sensibility. Effortless and yet full of character - Kate Moss, Gwen Stefani, and the 90s super models are my style icons among a long list. As I said earlier, Japan is a big influence on my style and how I style dolls. Their fashion scene is really diverse and advanced. I think the whole world is just getting ideas from them, really. Barcelona is also a big inspirational place for me, the arts and culture in Barcelona are amazing - one of my favorite destinations. Shasha: Please describe your creative process. Which activities do you enjoy the most? Which activities are not so interesting for you? Jake: My creative process would start at having an idea or a look in my head. I would then mentally sort the clothes I have in my box and see what stuff I have. Then I would figure out the perfect doll for the look. This or sometimes vice versa - I would have a particular doll in mind and figure out the look and vibe that would fit her and work around her. I think cleaning up the mess you made after you make a shoot is the part I hate the most LOL because sometimes you have look in mind but when you put it on your doll it doesn't work so you end up digging for other things and the next thing you know you have an explosion of doll stuff in your room. Shasha: I see there’s a lot of testing the waters in your process, which is, for me at least the best way to learn. Over the years of styling and photographing your pretty dolls on Instagram, what do you think are the top 5 things you have learned so far? Jake: 1. I always use natural light or place your doll table near a window. Natural light brings the dolls to life in my opinion. They register better in the camera, unless it depends on the look or art direction you're going for, but for me I always prefer natural light. 2. Know the tricks of the trade. Taking pictures of dolls is all about making an illusion. Behind the scenes, I have pins at the back of my dolls or masking tape holding them so they can stand and things like that. There is a lot of work involved in creating a look, do research and develop your own. And of course share it and exchange ideas with other doll collectors. 3. Poses are important for me as well. I really try my best posing my dolls and having that fluidity in them. I observe how models do it on magazine and try to emulate them with my dolls. The pose can also help in presenting the clothes properly and the doll. 4. Experiment and try to think of ways on how you can make a post where people haven't seen before - always make it new and fresh - even if you got inspired from somewhere, play with the idea to make it your own. 5. Know the right doll to use in every look you make. Some dolls are better in certain looks and some are not, it’s like casting for a perfect model as well. Shasha: Thank you so much for these 5 tips, Jake. I have asked these not only for our readers to take notes from, but also for me. I am very much a fan of your clean background and beautiful styling – especially the dolls’ hairstyles. They certainly show how much you love and enjoy the process. Can you tell us how this clean background of yours became so popular that I’ve been seeing more and more Instagram doll accounts incorporating this style in their photos and that even big name accounts have followed suit as well. Jake: It was not a conscious effort, really. I started with a few things and all I had was my doll and my clothes and my empty wall. And I kinda liked it and just carry on with it. I think it also helps you to focus more on the clothes and the look of the doll. I don’t take sole credit of it as well as we also see blank walls in photo shoots and what not. I had this idea that when I take pictures of my dolls it’s more of like polaroid shot before they hit the runway. Shasha: Do you have other favorite doll accounts, too? Can you give a shout out to at least 5 of them? Jake: I recently discovered this account @weiyuannnnnn - her clothes and styling are amazing. Really, people should check her out. I was really blown away with her looks and how she mix and match her pieces. @edelmo is also my all time favorite and one of the dolly accounts that influenced me in doing this. His style and the places where he takes pictures of his dolls are amazing! I had a pleasure of meeting him when I was in Barcelona and he was so nice and gracious. @mssolabarbie is also a fave, I like her moody lightning and different ways of presenting her dolls, as well as @oh_that_80s_boy - all 80s look and stop animation and lastly @oneof88 and yours of course! LOL I like your outdoors shoots. I follow a lot of dolly accounts really. Shasha: Wow, I am so flattered to be one of your faves, Jake. Like yours, my outdoor shoots are nothing but only making use of what I got. My white wall is my neighbor’s rustic gate post, of which I love the effect of so much. I also love @edelmo and @mssolabarbie with their distinct style on their feed. I will check out your other favorites because for sure they are awesome, too! If there’s something you think you ever need to improve on your feed, what would they be and why. Jake: I just mentioned about outdoor shoots. I would love to take my dolls outside more but usually I get really conscious of me and my dolls. I really don’t know why, so I should work on that. Plus maybe it’s so hot in Dubai now and staying outdoors is impossible. Shasha: If Mattel is going to knock on your door today and ask you to style one doll that they will be releasing in the market soon, how do you imagine her to be? Jake: Oh, wow! That would be a dream come true! Hmm.. nothing fancy but maybe something more contemporary, with lots of basic pieces of clothing that people can mix and match. Maybe I’d do something like a model’s outfit when she’s off to go to castings or something like basics. So, there you go guys! I hope you enjoyed that interview because I am so blown away by all the tips Jake generously shared with us and the interesting facts sprinkled in between. for the time answering my interview questions. and that your passion really shows in this personal venture of yours. More power to you and we can't wait what you're up to next! This was a great interview to read. I'm so glad to know there are so many doll lovers out there that are doing wonderful things. Thanks, Lydia! 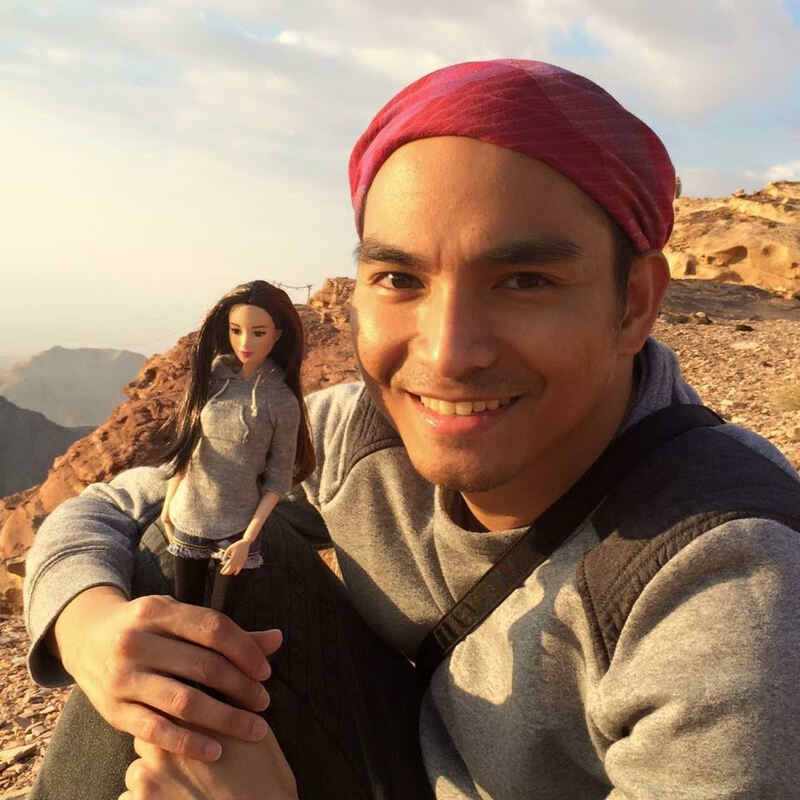 Yes, truly his account inspires us more to enjoy our dolls even more!